The Skechers GOmeb Speed 4 shoes are strong performers in high mileage races and do well for fast tempo runs. 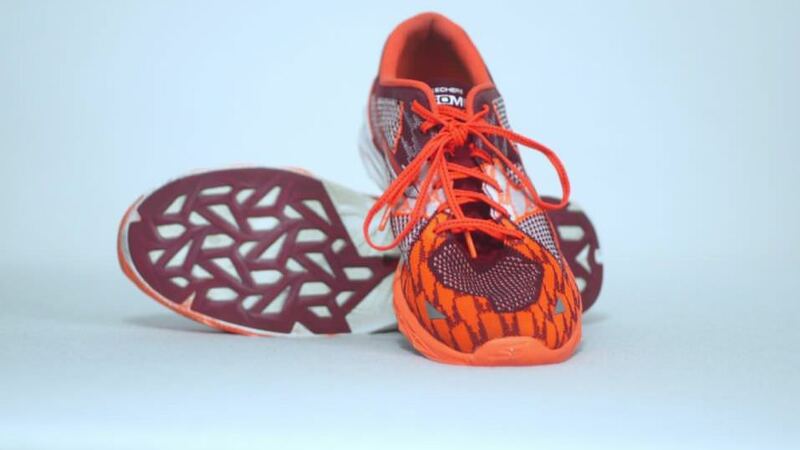 The shoes take the strong upper and light midsole from the previous Speed 3 shoes, and introduce a new outsole design. The Skechers GOmeb sped 4 is a racing shoe designed for the neutral runner with a wider forefoot looking for a shoe that will give a bit more support than the standard racing flat. Although there’s a “GOrun 5” out there and no “GOmeb Speed 5”, this is still one of the newest racing shoes by Skechers. Let me explain (or skip to the next paragraph if you just want to jump into the review). Meb Keflezighi is an elite marathoner (winner of NY and Boston marathons) and helps Skechers design their shoes. 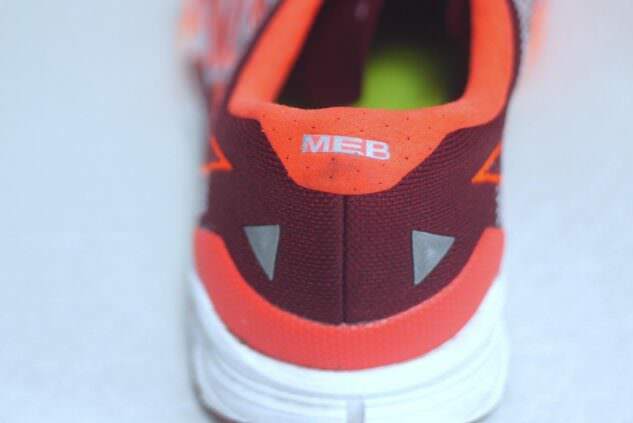 That’s why there’s a “meb” in GOmeb, and also why these shoes are great for high mileage racing. Now, Meb wants to make a perfect shoe for running the marathon and wanted a shoe for the 2017 Boston Marathon. Although the GOmeb Speed 4s were ready to go, Meb wanted a little more cushioning on the course. 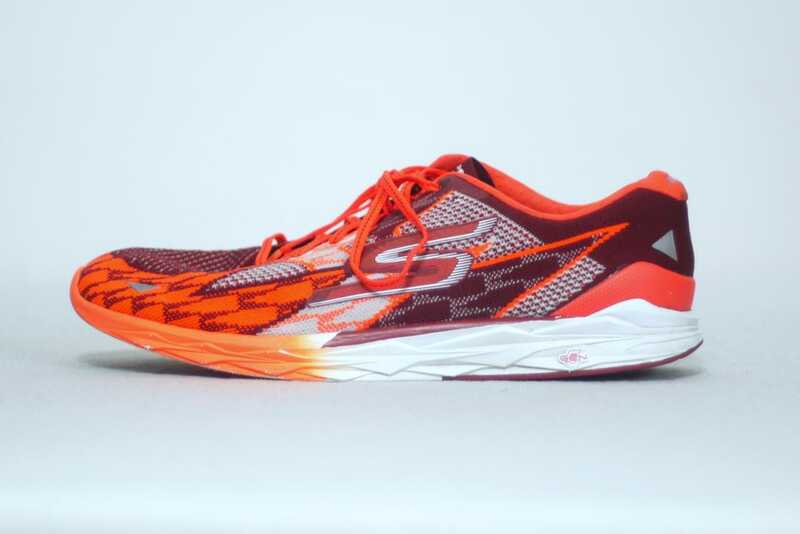 The details are a little fuzzy, but it looks like Meb and Skechers took cushioning found in the GOmeb Razor shoes, tweaked them a little, and called them the GOrun 5s. We’re just focusing on the GOmeb Speed 4s. The cushioning in the Speed 4s comes from a 14mm forefoot and a 18mm heel which gives you a 4mm drop. Just enough cushioning to stand above racing flats, and not enough cushioning to hold back the shoe in the weight department. I love lightweight daily trainers, so I spent 50+ miles testing these shoes on the track, road, treadmill, and even a little bit of trail to figure these shoes out. The GOmeb Speed 4 is part of Skechers’ performance line of shoes which also include the GOmeb Razor, and GOrun shoes. The GOmeb Razor and GOrun shoes are already pretty similar, so it makes picking the right shoe a bit of a challenge. The biggest reason to pick the GOmeb Speed 4 shoe over the GOrun and GOmeb Razor shoes is for the weight savings. The GOmeb Razor shoes are already pretty light at 7.7 oz in size 9, but the GOmeb Speed 4s are even lighter at 6.9 ounces in size 9. This is probably as lightweight as you want to get with high mileage racing shoes, as even lighter racing shoes like the Mizuno Universe 5 (2.8 oz) and Asics BlazingFAST (3.9 oz) offer hardly any support or cushioning. First time lacing up these shoes really makes you want to jump onto the road and knock out a fast 10k run. I could feel the resemblance to the previous GOmeb Speed 3 shoes, but also felt a few changes in the core design of the shoe. The sole did not rise up that much in the toebox, and some of the upper materials were switched for something new. The sole probably has the biggest change when compared to the previous GOmeb Speed 3 shoes. The outsole is completely redesigned while keeping the same lightweight theme. Skechers swapped out the rubber pod layout for a webbed rubber layout. This thin webbed rubber layout on the outsole is shared across many of the new Skechers performance shoes, such as the GOmeb Razor, and GOrun 5 shoes. The layout puts most of the rubber beneath your heel and toe, and leaves a patch of exposed foam beneath the midfoot. 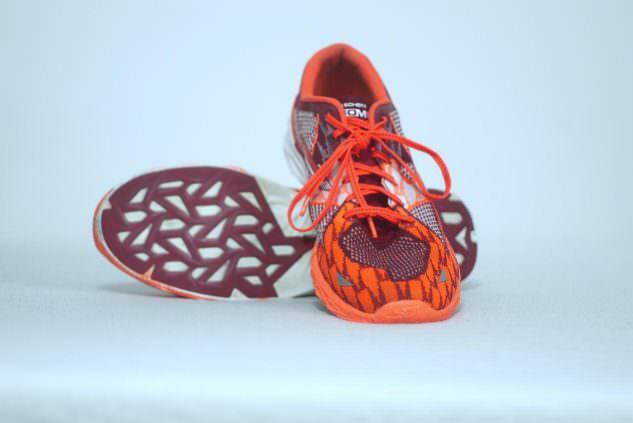 This exposed foam area is found in other lightweight racing shoes such as the Brooks Hyperion shoes. 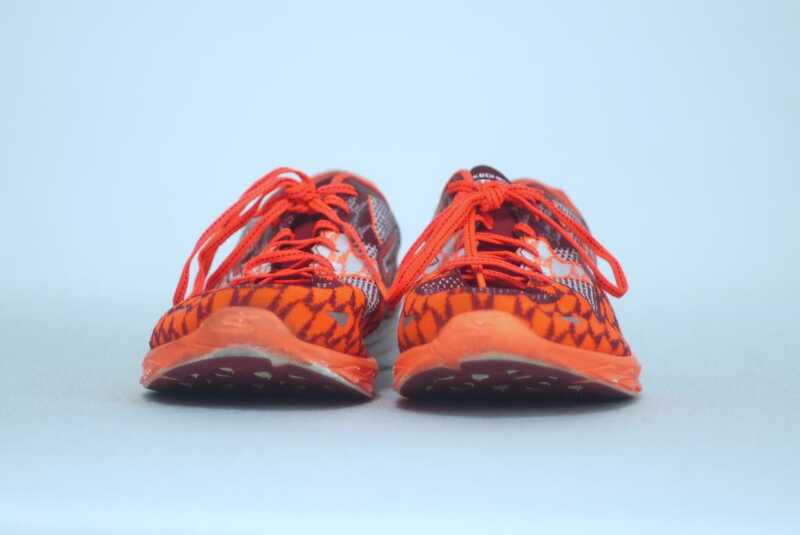 Using a small amount of rubber on the outsole gives the shoe just enough traction for the road, treadmill, and track, but not enough for the trail, and not enough durability for long term wear found in other trainers. I estimate the outsole will be good for most runners who want to get 200-300 miles out of the shoe before buying a new pair. I did find premature wear on the exposed foam after around 30 miles. Up next is the 5GEN cushioning system by Skechers that gives you a “lightweight and responsive” ride. This type of foam in the midsole feels pretty similar to what Skechers used in the past, but it’s supposed to be a little more responsive. What I noticed more in the GOmeb Speed 4s over the GOmeb Speed 3s is the curvature of the sole from the heel to the toe. It’s noticeably flatter which seems to complement a wider range of landing patterns, rather than the more curved pattern that seemed to aid those with a forefoot strike. Finishing out the sole is the glued in insole. You can rip it out and switch it with other insoles, but I recommend keeping it glued in unless you have custom orthotics. Insoles that are glued in obviously don’t slip around as much as standard insoles, and they are less prone to develop squeaking which happens as shoes age. As a side note, I wish the Nike Free RN Motion Flyknits glued in their insoles. 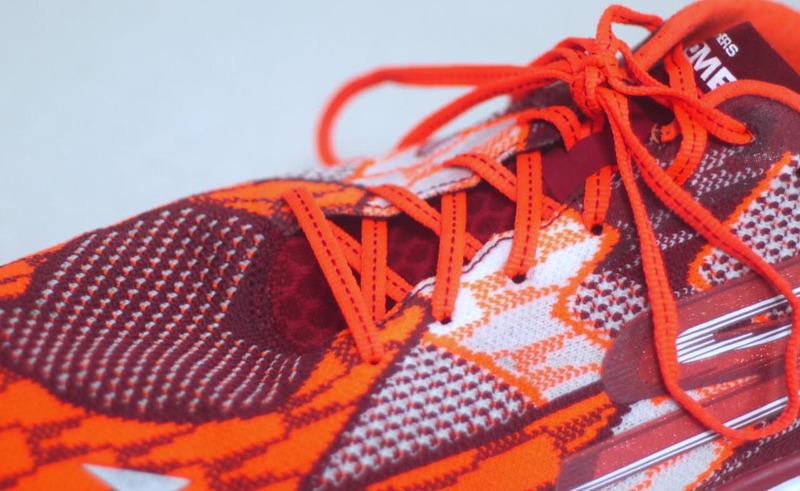 It’s a strong, vibrant, and breathable upper, called GOknit. Everyone seems to have some sort of knitted upper now, where Nike has Flyknit and Adidas has Primeknit. All pretty similar, all pretty great, all usually a better choice than the standard synthetic uppers out there. What GOknit provides is a very specific type of fit for a shoe. The fabric is a near continuous wrap of custom woven threads that thicken in high stress areas and loosen in areas that need more breathability. The thread used in this shoe does not stretch much, so lacing the shoes up tightly will always hold your feet in tightly. This could be a problem if you want some wiggle room in your shoes after lacing them up, or if you’re used to slipping shoes on and off without untying them. In addition to the material properties of GOknit, Skechers throws some snazzy designs and colors into the fabric. You’ll get an assorted array of jagged triangles and zig-zags in your choice of 4 neon colors. This shoe is designed to make you stand out at the starting line, and hopefully stand up on the podium. Skechers made a few little changes to the rest of the upper, starting with the heel counter. What used to be a simple wrapped around section of fabric now has a thin crescent of plastic to add a tad more strength in the heel. This might be where the extra 0.1 ounces comes from when compared to the previous model of the shoe. The other noticeable change to the upper is the thinner tongue, which now is now basically a 1-2mm low-profile tab of felt that extends just the right amount past the last lace loop. Finishing out the top is the sleek lacing system that uses a reinforced fabric upper instead of using metal or plastic eyelets. This follows the theme of reduced weight and reduced durability. 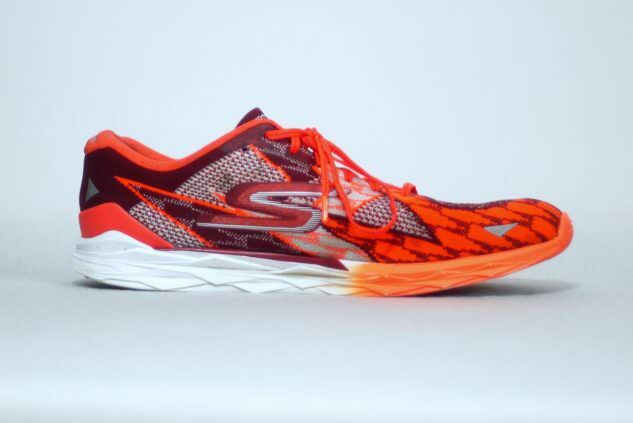 The Skechers GOmeb Speed 4 is a speedy racing shoe that brings a few changes to the GOmeb Speed shoes. It’s a great choice for those who want a racing shoe good for 10km or higher, and do not need the extra cushioning found in the GOmeb Razor line. Just make sure to check out the GOrun Speed 5 and GOmeb Razor shoes before picking the GOmeb speed 4s since they all share the same DNA. We thank the nice people at Skechers for sending us a pair of GOmeb Speed 4 to test. This did not influence the outcome of the review, written after running more than 50 miles in them. I just ran a half marathon in the GoMeb Speed 4 on February 3, 2018. Overall, they were comfortable and quick, helping me shave a minute and a half from my best. The DuPont plate seems to lift the feet and propel the runner forward. The cushion is probably best for a 10K, and I was beginning to feel the 4 mm ramp around 8.5 miles into the course. But the shoes have held up well to 58 miles, showing almost no wear. The rubber soles are fine, and they provide decent traction on the snow and ice of the Alaskan roads this winter. The shoe laces might be a little short, but they have not come undone.